2. 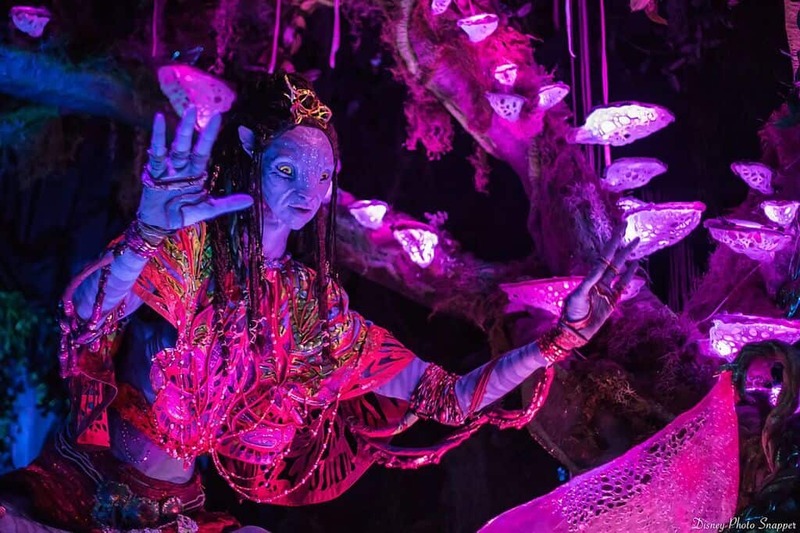 Na’vi River Journey – Also found in Pandora – The World of Avatar is a second attraction that is popular like Avatar Flight of Passage, but more family friendly. The Navi River Journey brings guests into the bioluminescent forests that Pandora is so well known for and has them sail on an unforgettable journey. Guests begin in the quiet forest observing creatures and vegetation that are both alien and beautiful in their appearance. Slowly, music begins to build and guests spot several Na’vi all seeming to head in the same direction. As the music continues to build, guests move further into the forest and notice that groups of Na’vi seem to be heading towards the source of the music. The final scene of Na’vi River Journey brings guests face to face with the Shaman of the Forest who is celebrating the beauty of Pandora through song. The Shaman is one of the most technologically advanced audio-animatronics ever developed, and guests will be blown away by how lifelike she is. Since the Na’vi River Journey features a mostly covered queue and indoor attraction, it is a great option to enjoy on a rainy day in Disney’s Animal Kingdom.